Notes: Di Gi Charat was originally the mascot character for the Gamers franchise of anime and video game stores in Japan (with one location in California), but has itself become the flagship franchise for the company Broccoli, which creates and funds merchandise as well as other anime series. There are several manga series based on this character. This series aired as a segment in the Wonderful anthology TV series. Di Gi Charat (call her Digiko for short) and Petit Charat (Puchiko) come down to Earth, where they want to be idols, or something like that. Rabi en Rose (a random girl with bunny ears whose real name is Usada Hikaru) decides they're in her way of becoming an idol herself. They all end up working at Gamers, where various otaku, children, and humanoid finger puppets walk in and act like morons. Well, actually, they all act like morons. There's cute. And then there's excessive. 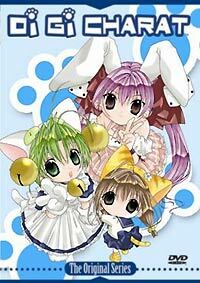 Di Gi Charat goes one step beyond even that, into the realm of the psychotic. For one, the characters themselves, apart from being cute, have schizophrenic, sometimes homicidal personalities that just incite cringes from any sane member of the audience. (Or seizures from others.) The animation is, quite frankly, horrible, and one hopes that this wasn't the flagship for Wonderful, as this show simply isn't. The music is passable J-Pop, and the voice acting - well, the seiyuu-nyo do what they're told-nyo, and they're paid for it-nyo. That's as much as I'm willing to say on that-nyo. Story? Plot? Well, the animators didn't seem to think it was particularly necessary, as any semblance of plot was dumped in favor of a random celebration of otaku weirdness. (I have the strange feeling that even THEM wouldn't animate something quite this strange.) Lasers shoot out of Di Gi Charat's eyes to punish window-shoppers. Humanoid fingers (the animators were too lazy to animate -humans- apparently) swing around the store like monkeys. And that "Gema" thing ... whatever, indeed! The episodes are far too short to do even gags with, and the only gags that work in this series seem to be the gags tied around the people at the studio who thought it was a bad idea. Though the characters are really well drawn in quite a few still frames, that's the best thing I can say about a series that would insult the intelligence of my little nieces. I'm just glad I watched better anime after viewing this. (Then again, almost any anime qualifies as being better.) I guess if you want to see the apparent brainchild of some otaku circle that has nothing better to do with their lives, or if you don't care about plot or any traditional criteria for good entertainment, then Di Gi Charat is fine.